No one should be surprised to find out that there is a petition circulating, and getting many, many signatures, in an attempt to force The Quicken Loan Arena to allow Republican Delegates to carry their firearms inside... during the convention. Their policy, however, does not allow this, even though Cleveland is an 'Open Carry' city. Me? I think they should set the policy aside for this one event. Republicans have long been staunch advocates of very liberal gun laws and this is their chance to put their money where their mouth is and prove they are correct. 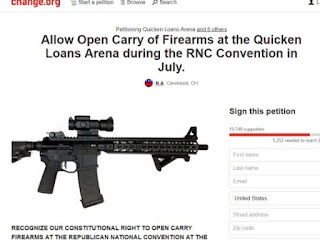 In fact, I'm waiting for the Republican candidates to jump on board, sign their names, and demand their followers be allowed to enter the arena fully armed. Trumplodites and Cruzidopes would be the final nail in the Republican coffin. Which is why I think we should all sign this petition. What was it my granny used to say? The proof is in the pudding. A chum of mine who was in the war with me said he thought this would be a very safe convention. I countered by saying the odds are it was going to end up worse then the Chicago convention of '68, except this time with guns. He pondered this for about a minute and then nodded, "yeah" he said, "you're probably right." Which is why the arena will maintain it's policy. Keep the rioting outside. Besides, do you have any idea how much it would cost to dome the stage with bullet proof glass? The GOP is all about the right to bear arms so let 'em bring guns in.